If you want to earn Choice Privileges points directly, you can use the Barclaycard Choice Privileges® Visa Signature® Card. This card earns 2X points per dollar on everyday purchases, which will pair nicely with the Choice Privileges shopping portal. You can also earn Membership Rewards points, which can be transferred to the Choice Privileges program almost instantly. Choice Hotels has over 6,500 properties in 35 countries and territories. 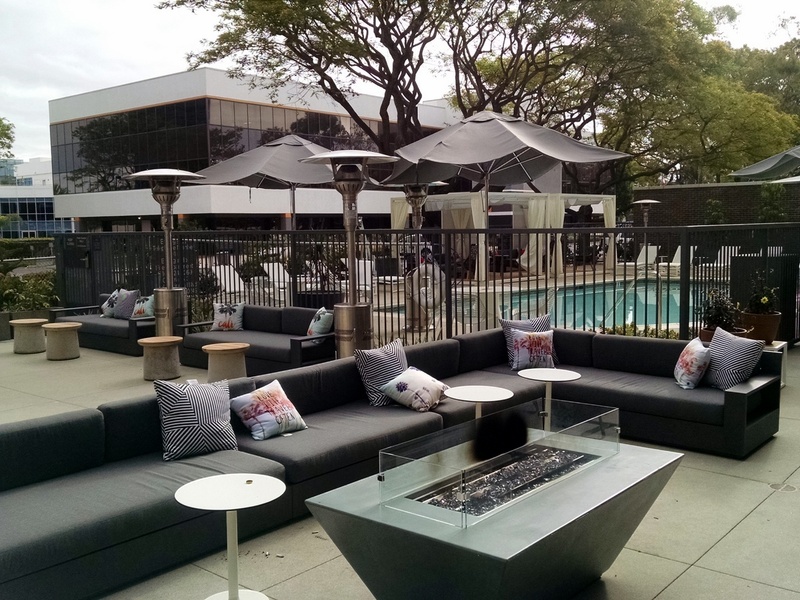 Known for budget brands such as Comfort Inn and Clarion, Choice is expanding its mid-upscale Cambria brand and it’s upscale Ascend Collection. Register online for a free Choice Privileges account. Travelers based in the Nordic and Baltic countries may prefer to join the Nordic Choice Club, which is a separate program for the 190 hotels in that region. There are reciprocal benefits between the 2 programs, though they are distinct and have differences. 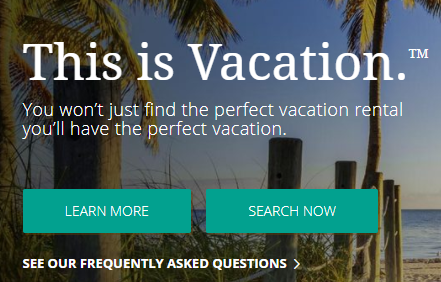 Sign in on the choicehotels.com homepage. The My Point Activity page shows all your recent point activity. 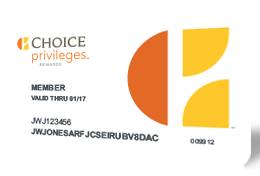 In 2016, Choice Privileges instituted a more flexible points expiration policy. Now points do not expire as long as you have qualifying activity once every 18 months. Eligible activity includes earning points from stays, using the Choice Privileges Visa® card, and purchasing points. Your points stay active even with a stay where you choose to earn miles or Amtrak Guest Rewards instead of points. You can also Refer-a-Friend to Choice Privileges; once they complete a qualifying stay, your points expiration will be extended. Registering for free with Choice Privileges gets you space available late check-out at 2 pm. Cambria Hotel & Suites has their Collectible Coaster Program. For each points-eligible stay at a Cambria, you get a collectible coaster that can be redeemed for a buy 1, get 1 free drink at the hotel bar (or 250 points). General members can only book award nights 30 days in advance in the U.S. and Canada, and 60 days in advance elsewhere. Choice Privileges elite status does not have the glamorous benefits of some major hotel programs, reflecting the economical style of most of their properties. There is no free internet or free breakfast benefit. Only Diamonds have room upgrades as an official benefit, though hotels can upgrade Gold and Platinums at their discretion. Unusually, Choice Privileges does not make award nights available to book via its full paid booking calendar. Rather, elite status determines when you can book award stays. Advance planners will appreciate being able to book awards farther in advance with higher status. Earning Choice Privileges elite status is refreshingly straightforward: you earn by the number of nights per year — and both paid and award stays count. With elite status in other hotel programs, you can apply for an elite status match by emailing Status_Match@choicehotels.com. Choice Privileges does not publish which hotel programs and status levels it matches. You can try checking recent user-submitted reports at the independent Status Matcher site. A match granted in January-June will be good for the remainder of the calendar year. One granted in July-December will be good through the entire following calendar year. Earning Choice Privileges points starts with hotel stays. Choice Privileges has harmonized points earning among its brands. No longer will you earn fewer points per dollar at its budget brands. You earn 10 points per dollar on up to 4 rooms per night on qualifying stays. Note that you cannot earn points for stays in Brazil, China, Denmark, Ecuador, Estonia, Finland, Guyana, Iceland, India, Japan, Latvia, Lithuania, Norway, and Sweden. In the Denmark, Estonia, Finland, Iceland, Latvia, Lithuania, Norway, and Sweden, you can earn points by registering in their separate Nordic Choice Club program. Planners booking meetings with 10 or more rooms per night earn 4 points per dollar on meeting rooms, guest rooms, and food and beverage. Book here. Choice Hotels has launched a Vacation Rentals program that also earns 10 points per dollar. You need to select a Your Extras preference in your Choice Privileges account to receive the benefit. Choice Privileges typically runs a promotion several times a year that offers 1 free night when you stay 2 paid nights. If you have infrequent stays at Choice Hotels, it can make sense to choose to earn airline miles or Amtrak Guest Reward points for your stays instead of points. Check for regular promotions such as 1,000 Air Canada Aeroplan miles or 1,000 Amtrak Guest Reward points per stay. Hotel award nights are the primary Choice Privileges points awards. From standard awards to points + cash, there are great values to be found. Important: Before you search and get frustrated that there seem to be no award nights available, be aware that general members can only book awards 30 days in advance for the U.S. and Canada, and 60 days in advance elsewhere. Elite members can book earlier. Farther out, you won’t see any awards available. Choice Privileges has over 6,500 properties available for award nights. There are no published award charts. Instead, awards start at 6,000 points, with over 1,500 properties priced at 8,000 points or less. The maximum award night price is 35,000 points (except for a whopping 75,000 in Australia). Pricing is seasonal, so the same hotel may cost a different points price at different times of the year. Log in to your Choice Privileges account and search on the redeem points page to find specific pricing. Compare Cash + Points results with regular points results; you may find some great values. Cash + Points show up in award night searches where available. Many Choice Privileges properties have multi-room suites ideal for families. These can be pricey in cash. The great news is that if they are available for award booking, the price is the same as a standard room! Many European properties offer excellent points value in popular tourist destinations, with city center locations other chains may lack. Even better, breakfast is often included for free. In the Nordic countries, while you can’t earn points for stays, you can still redeem points for stays. These hotels may have a free breakfast, too, and sometimes even an evening smorgasbord. When searching for award nights, you may come upon special low pricing called FlexRewards. Certain properties offer these discounted rates on either Sunday-Thursday or Friday-Saturday. You do not need to do anything special to book FlexRewards. You’ll book them the same as regular award nights. The 500+ Preferred Hotels & Resorts include some of the most luxurious hotels in the U.S. Award nights range from 25,000-55,000 points per night. Not only can you earn points for your vacation rental stays, but you can also redeem points. Search availability here. You can use 16,000 points for a 2-night stay at 6 participating Bluegreen Vacations properties. You also get a $50 gift card. Note that you will have to participate in the usual timeshare rigamarole. Choice Privileges members also receive telemarketing calls about booking Bluegreen stays using cash. You can redeem Choice Privileges points for gift cards. 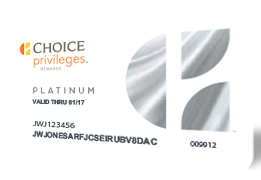 Choice Privileges is the hotel loyalty program for Choice Hotels, which has 11 brands and over 6,500 properties worldwide. Why should I join Choice Privileges? Is it worth it? Choice Privileges is a free frequent guest program from Choice Hotels. Registration is free, and you can earn and redeem points from Choice Hotels award nights. Is there a Choice Privileges credit card? 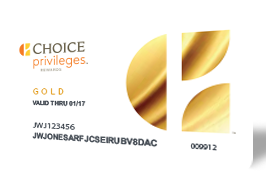 The Barclaycard Choice Privileges® Visa Signature® Card earns 5x points per dollar at Choice hotels and 2x points per dollar on everyday purchases. Will I earn more Choice Privileges points with elite status? 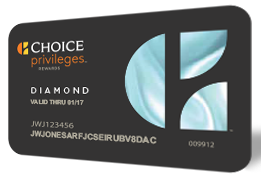 Yes, Choice Privilege elite status earns bonus points on stays: Gold (10%), Platinum (25%), and Diamond (50%). How many Choice Privileges points do I have? To see your points balance, sign in to your Choice Privileges account and view your activity. What are Choice Privileges points worth? Points vary in value by property and season. Award nights range from 6,000-35,000 points per night (75,000 in Australia). Are Choice Privileges points transferable? Yes. You can transfer them to other Choice Privileges members (for a fee), donate them to charity, or transfer them to travel partners. When do Choice Privileges points expire? Choice Privileges points will expire after 18 months of no account activity. Where is my Choice Privileges number? You’ll see your rewards number when you log in to your account. Which hotels are included in Choice Privileges? The Choice Privileges family of brands includes: Ascend, Cambria, Comfort Inn, Comfort Suites, Sleep Inn, Quality, Clarion, MainStay Suites, Suburban Extended Stay, EconoLodge, and Rodeway Inn. You can also redeem points for Preferred Hotels. Choice Privileges has the worst customer service and I will never and none of my contacts will ever use them again.